OUR PODIUMS COMPLY WITH THE NEW PAS250 BSI GUIDELINES. CHOOSE FROM THE STURDY AND VERY STABLE P1000,P1200,1500,RANGE. 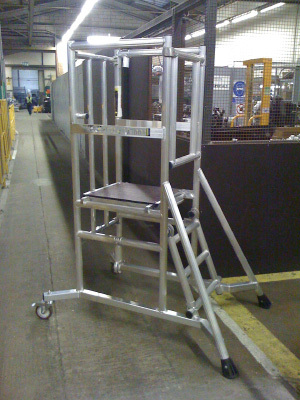 IDEAL FOR INDUSTRIAL USE WITH A SAFE WORKING HEIGHT OF 2.94m. STABLE WHEN FOLDED FOR TRANSPORTATION AND AUTOMATIC WHEN OPENED FOR WORK MODE. QUICK AND EASY ASSEMBLY WITH CAPTIVE DECK AND STAIRS. IDEAL FOR INDUSTRIAL USE WITH A SAFE WORKING HEIGHT OF 3.15m. IDEAL FOR INDUSTRIAL USE WITH A SAFE WORKING HEIGHT OF 3.44m.